Chelsea Handler ratcheted up her personal insults against First Lady Melania Trump on social media Tuesday. “Blink if you need help @MELANIATRUMP” Handler tweeted. Handler’s latest swipe at the First Lady came just days after the comedienne and Netflix talk show host said she would never interview President Trump or his wife for her show, even if the President himself had requested the meeting. “No. Melania? To talk about what? She can barely speak English,” the Chelsea host said Monday during an interview with Variety at the Sundance Film Festival, despite the fact that the First Lady is fluent in her native Slovenian, French, Serbian, German, and English. “I don’t respect either one of those people,” she added. 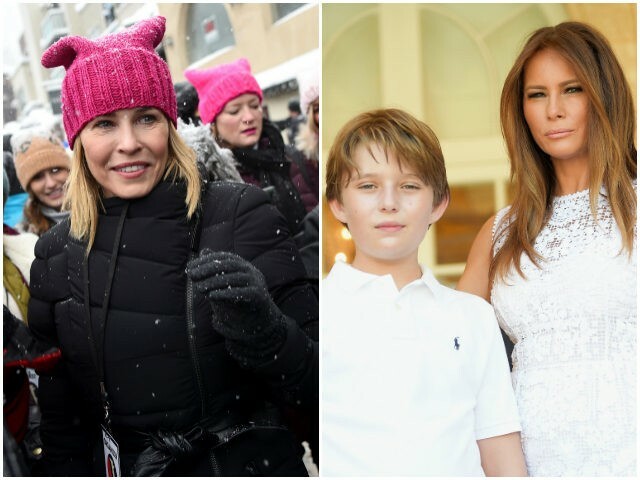 On Tuesday night, Handler sent another Tweet which appeared to condone a Saturday Night Live writer’s attack on Barron Trump, the 10-year-old son of the president and First Lady. This is hardly the first time Handler has gone after Melania Trump. In October, the 46-year-old sent a series of demeaning tweets toward the First Lady. Melania Trump agreed to give a speech supporting her husband in Philadelphia this week; it’s either that or back in the crate. On Saturday, the comedian led a group of demonstrators at the Sundance Film Festival in Park City, Utah for the Women’s March on Main, a march to protest Trump’s inauguration.